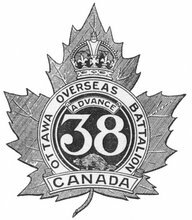 Joined the 166th Battalion, CEF, in Toronto, Ontario, on 31 January 1916 (number 669717) - taken on the strength of the 38th Battalion, CEF, on 27 November or 1 December 1916 - killed in action on 3 January 1917 - buried in Canadian Cemetery No. 2, France (grave 3.A.10). (Photograph of Pte Wilson's headstone taken by me in April 2007).